We prepare our Mastic Oil from the gum of Mastic trees which have been Certified Organically Grown in Chios Island in Greece. The Gum extracted with low heat into cold-pressed certified organic olive oil. You will not find strongest infused oils. Compare our colors to other oils on the market, most of which are pale, our oil is much deeper. 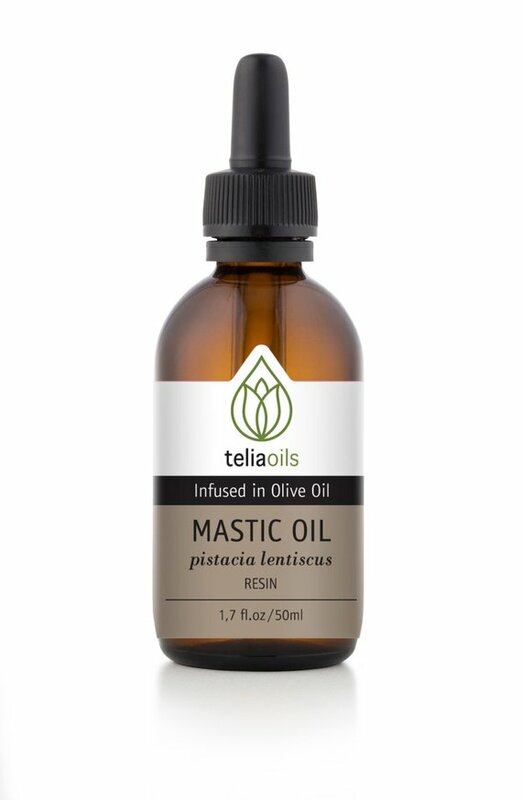 Open a bottle of our Mastic infused oil and you rewarded with the fragrance of the Mastic, not the smell of the Olive oil. We use the best Organic Olive oil and add there the unique Mastic gum. The oil and the resin warmed for a week, then is drained and recharged with more Mastic gum. - This procedure repeated for 3 times and we create a triple-infused therapeutic oil. -- We add in our oils double quantity of Mastic than other producers. Mastiha has excellent wound healing and suturing properties, while at the same time it does not bring undesirable side effects to the skin (such as dermatitis, skin decoloration, etc), like other common healing products do. ★Chios mastic oil, has been incorporated in the growth medium, it can delay the growth rate but also eliminate microbes, bacteria and pathogenic microorganisms. BENEFITS: ★Softens and tones the skin ★Reduces aging ★Sedative, relieves from anxiety and stress ★Anti-bacterial ★Anti-viral ★Anti-fungal ★Anti-inflammatory ★Anti-oxidant ★Soothe the skin.